Set your sights on the best of the Canadian Rockies, as you arrive in Calgary and transfer to the resort town of Banff. Enjoy a sightseeing tour; quintessential Banff sites, such as the hot springs; a gondola ride and much more over the course of two days before transferring to Lake Louise for an overnight in Lake Louise's iconic Chateau. The next morning, soak up the scenery and board an Ice Explorer for a trek onto the Athabasca Glacier enroute to Jasper. 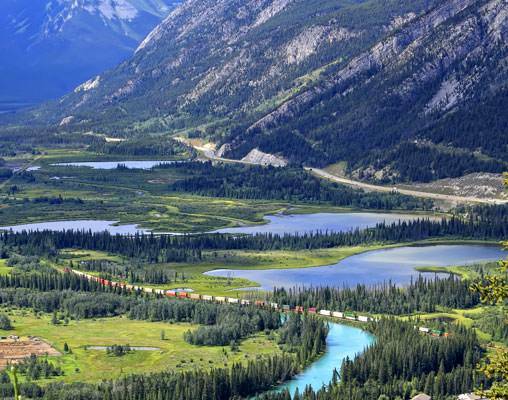 You'll have a full day to explore the beautiful town of Jasper and its eponymous National Park. 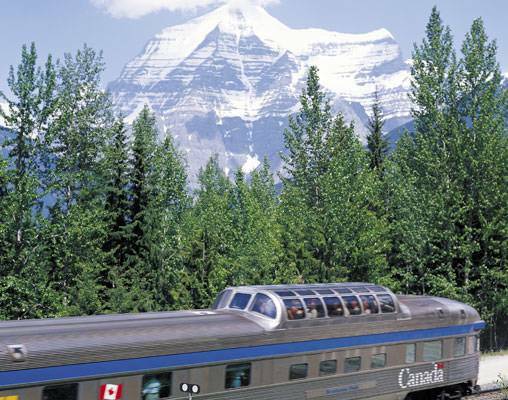 The following day, it is all aboard VIA Rail's Canadian for an exciting ride through the mountains to Vancouver. 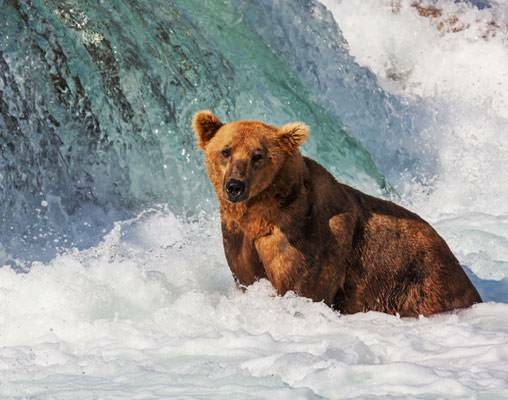 Take in all of the historic sites and iconic neighborhoods this coastal city has to offer with a Hop-on Hop-off tour, before stepping aboard Holland America's ms Nieuw Amsterdam for a 7-night cruise through Alaska's Inside Passage. 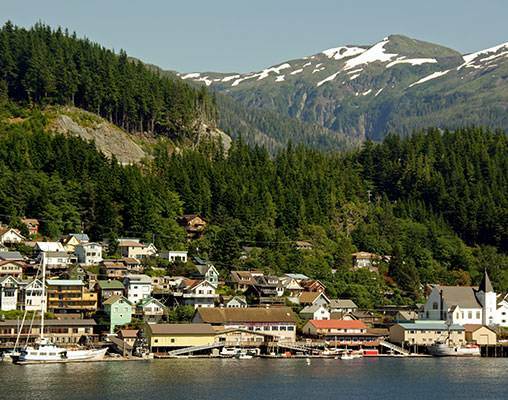 There are ample opportunities to explore during the journey, including excursions to Juneau, Skagway, and Ketchikan. The ship heads through the awe-inspiring Inside Passage before returning to port in Vancouver, where the tour comes to a close. Fly into Calgary's international airport and transfer to Banff, your home for two nights. Once you've settled into your accommodations, explore the grounds and all the amenities this grand hotel has to offer, or head out and start exploring this beautiful town. Make time during your stay in Banff to visit the Banff National Park and the Banff Upper Hot Springs, which are located inside the Park. Overnight Banff. Banff is a veritable outdoor playground filled with pristine ski slopes, hiking trails, and bike paths. Banff was originally settled by the Canadian Pacific Railway in the 1880's. Today visit some of its most famous sights on your guided tour of Banff. Learn about the history of the town as you visit some of its most scenic areas including Tunnel and Rundle Mountains, the Cave and Basin National Historic Site, and the Hoodoos as well as a ride on the Banff gondola to the top of Sulphur Mountain. The views of the Bow Valley are just stunning. Overnight Banff. Take the morning to revisit some of your favorite spots in town or seek out new ones. This afternoon, travel west to Lake Louise. Upon arrival at the Chateau, take the time to view the lake and explore the grounds. The original Chateau was built by the Canadian Pacific Railway over the course of several years as a means to entice wealthy travelers to vacation by rail in the West. 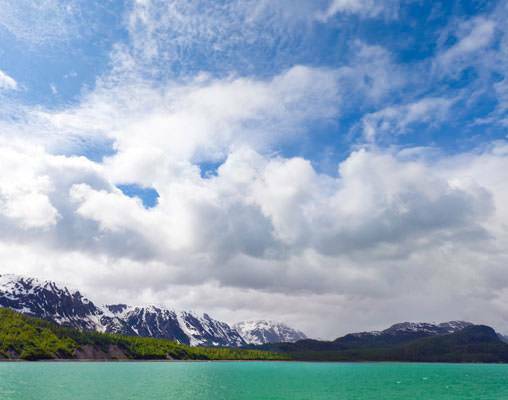 Take advantage of picturesque photo opportunities around the tranquil lake with its shimmering turquoise waters and Victoria Glacier looming in the distance. Overnight Lake Louise. Spend the day exploring Jasper and its famed National Park. or you may elect to take a ride on the Jasper Tramway. Perhaps spend the day hiking or biking the area, soaking in the hot springs or riding the Jasper Tramway. Overnight Jasper. After breakfast on your own, transfer to the rail station for your departure aboard VIA Rail's Canadian to Vancouver. You have a full day to explore this beautiful coastal city on your own. Revisit some of your favorite sights from yesterday's tour, dine at the city's many critically-acclaimed restaurants, or perhaps take an optional day-trip to Victoria or Whistler. Overnight Vancouver. This morning finds you cruising the narrow Tracy Arm Fjord,* a deep waterway full of jaw-dropping amounts of floating ice. At the end of the fjord are the massive Sawyer Glaciers. 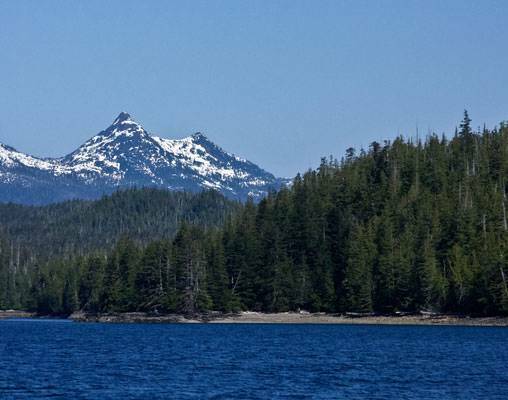 The area boasts both breathtaking scenery and an assortment of wildlife including harbor seals, goats, and wolves. Hotels include the Ptarmigan, Fairmont Chateau Lake Louise, Whistler Lodge, and Georgian Court. VIA Rail accommodations are in Sleeper Plus class in a semi-private berth. Meals are included aboard the train along with exclusive access to lounges and observation cars. Travel aboard the ms Nieuw Amsterdam is in an Inside cabin including two lower beds convertible to one Queen-size bed and shower. Hotels include the Fairmont Banff Springs Hotel, Fairmont Chateau Lake Louise, Fairmont Jasper Park Lodge, and Fairmont Waterfront (or similar). VIA Rail accommodations are in Sleeper Plus class in a private cabin. Meals are included aboard the train along with exclusive access to lounges and observation cars. Travel aboard the ms Nieuw Amsterdam is in an Oceanview cabin including two lower beds convertible to one Queen-size bed, bathtub, and shower. Hotels include the Fairmont Banff Springs Hotel, Fairmont Chateau Lake Louise, Fairmont Jasper Park Lodge, and Fairmont Waterfront (or similar). VIA Rail accommodations are in Sleeper Plus class in a private cabin. Meals are included aboard the train along with exclusive access to lounges and observation cars. Travel aboard the ms Nieuw Amsterdam is in a Verandah Suite including two beds convertible to one Queen-size bed, whirlpool bath and shower, sitting area, private verandah, mini-bar, refrigerator, and floor-to-ceiling windows. 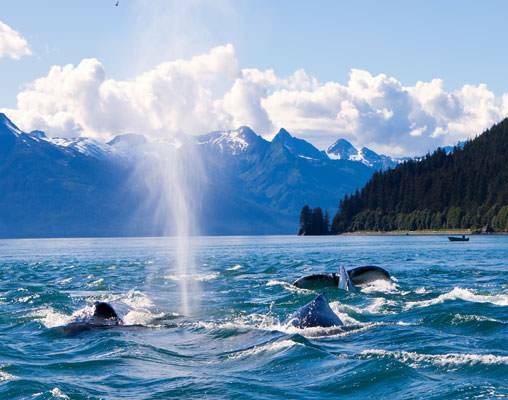 Click here to view testimonials for Canada’s Rockies & Alaska Cruise. This trip was very well coordinated and everything went off like clock-work. The scenery, accommodations, tour guides and transportation were excellent. We had no issues at all and that's the way a vacation should be! This trip was one of a lifetime! We had excellent help and support from Courtney, our consultant. So I don't know that there is anything we would change or add. All was planned well and on time with good people to work with during travels. Enter your details below if you would like to be notified when 2020 dates and prices are available for Canada’s Rockies & Alaska Cruise. Hotel and Rail accommodations listed above, are subject to change based on availability at the time of booking. Prices are correct at the time this web page is published; however, are subject to change. Prices are land-only, per person based on double occupancy. Transfers from Calgary Airport are included for flights arriving in Calgary by 7:00 pm. Private transfers are available at an additional cost for flights that do not fit with the schedule listed. 2019 Port taxes range from $245 - $260 per person and will be added at time of booking. Passports are required for this vacation. * In the event that there is heavy ice flow, the Tracy Arm shore excursion may not be offered on a particular sailing. 2019 sailings will not include the Tracy Arm excursion.